Which of these product rules could be used to quickly expand (x+y+3)(x+y-3)? Now, try expanding the expression. What if I tried to apply my understanding of I can look for and make use of structure to Jeff’s challenge? Note: There is a right parenthesis missing in the figure above. It should have (x+y)² in the area that represents (x+y)(x+y). What if we coach our learners to make their thinking visible? 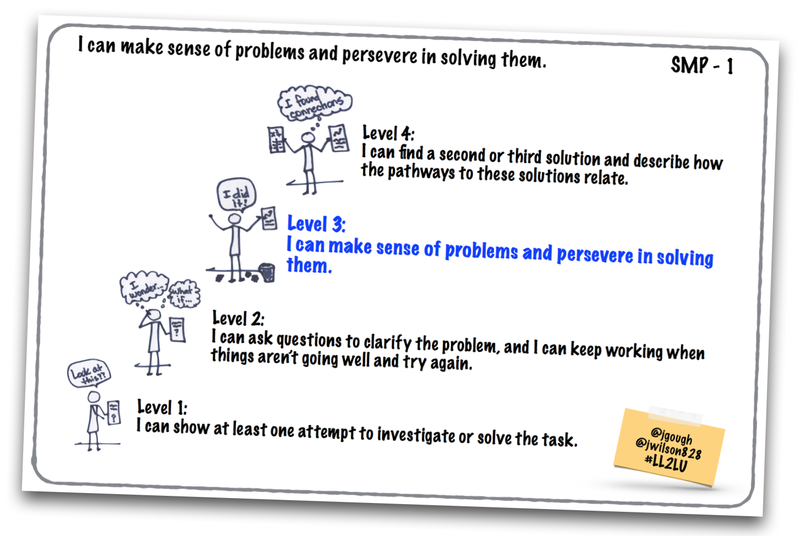 What if we use learning progressions for self-assessment, motivation, and connected thinking? I admit that I was quite happy with myself with all that pretty algebra, but then I read the SMP-7 learning progression. Could I integrate geometric and algebraic reasoning to confirm structure? 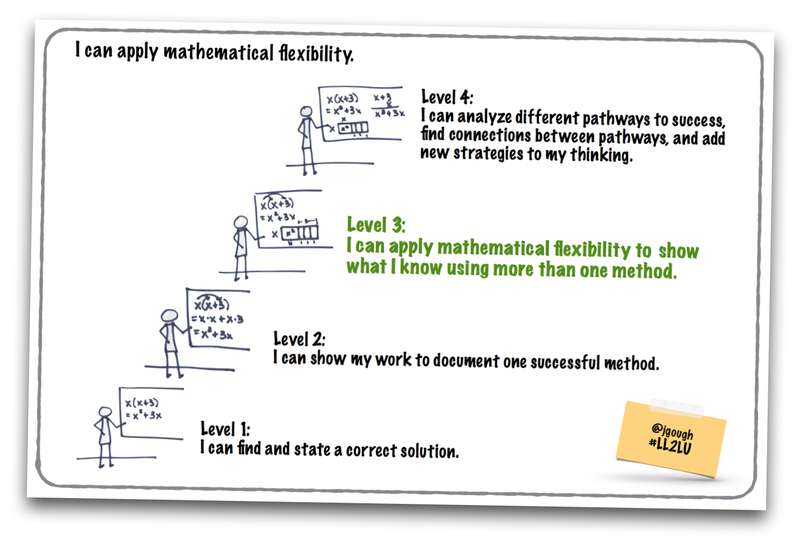 How flexible am I as a mathematical thinker? I lack confidence with geometric representation using algebra tiles, so it is not my go to strategy. However, in the geometric representation, I found what Jeff was seeking for his learners. I needed to see x+y as a single object. How might we model making thinking visible in conversation and in writing? 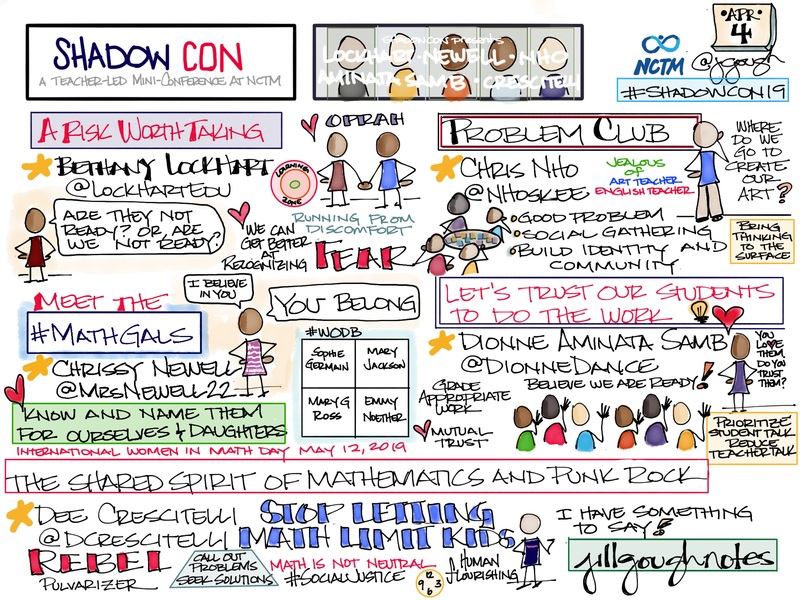 How might we encourage productive peer-to-peer discourse around mathematics? How might we facilitate opportunities for in-the-moment self- and peer-assessment that is formative, constructive, and growth-oriented? But…What if I think I can’t? What if I have no idea what “structure” means in the context of what we are learning? How might we offer a pathway for success? What if we provide cues to guide learners and inspire interrogative self-talk? I can integrate geometric and algebraic representations to confirm structure and patterning. I can rewrite an expression into an equivalent form, draw an auxiliary line to support an argument, or identify a pattern to make what isn’t pictured visible. I can compose and decompose numbers, expressions, and figures to make sense of the parts and of the whole. Are observing, associating, questioning, and experimenting the foundations of this Standard for Mathematical Practice? It is about seeing things that aren’t readily visible. It is about remix, composing and decomposing what is visible to understand in different ways. How might we uncover and investigate patterns and symmetries? What if we teach the art of observation coupled with the art of inquiry? In The Innovator’s DNA: Mastering the Five Skills of Disruptive Innovators, Dryer, Gregersen, and Christensen describe what stops us from asking questions. So what stops you from asking questions? The two great inhibitors to questions are: (1) not wanting to look stupid, and (2) not willing to be viewed as uncooperative or disagreeable. The first problem starts when we’re in elementary school; we don’t want to be seen as stupid by our friends or the teacher, and it is far safer to stay quiet. So we learn not to ask disruptive questions. Unfortunately, for most of us, this pattern follows us into adulthood. But many people are petrified of bad ideas. Ideas that make us look stupid or waste time or money or create some sort of backlash. The problem is that you can’t have good ideas unless you’re willing to generate a lot of bad ones. Painters, musicians, entrepreneurs, writers, chiropractors, accountants–we all fail far more than we succeed. How might we create safe harbors for ideas, questions, and observations? What if we encourage generating “bad ideas” so that we might uncover good ones? How might we shift perspectives to observe patterns and structure? What if we embrace the tactics for asking disruptive questions found in The Innovator’s DNA? What are barriers to finding structure? How else will we help learners look for and make use of structure? Dyer, Jeff, Hal B. Gregersen, and Clayton M. Christensen. The Innovator’s DNA: Mastering the Five Skills of Disruptive Innovators. Boston, MA: Harvard Business, 2011. Print. People see mathematics in very different ways. And they can be very creative in solving problems. 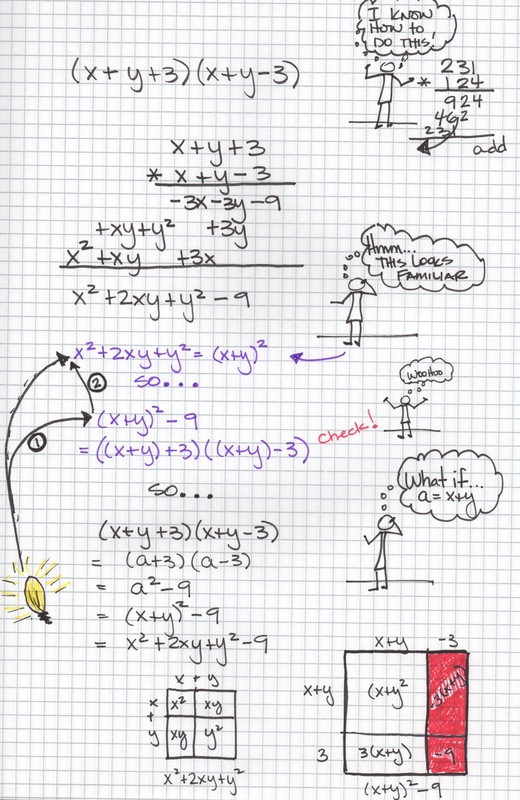 It is important to keep math creativity alive. When you learn math in school, if a teacher shows you a method, think to yourself, what are the other ways of solving this? There are always others. Discuss them with your teacher or friends or parents. This will help you learn deeply. I keep thinking about mathematical flexibility. If serious about flexibility, how do we communicate to learners actions that they can take to practice? What if we display learning progressions in our learning space to show a pathway for learners? After Jennifer Wilson (Easing the Hurry Syndrome) and I published SMP-1: Make sense of problems and persevere #LL2LU, I wondered how we might display this learning progression in classrooms. Dabbling with doodling, I drafted this visual for classroom use. Many thanks to Sam Gough for immediate feedback and encouragement during the doodling process. I wonder how each of my teammates will use this with student-learners. 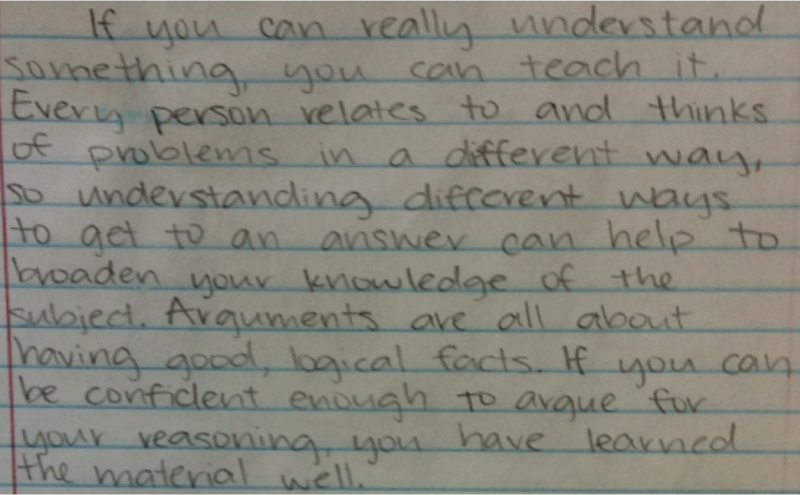 I am curious to know student-learner reaction, feedback, and comments. If you have feedback, I would appreciate having it too. What if we are deliberate in our coaching to encourage learners to self-assess, question, and stretch? But…What if I think I can’t? What if I’m stuck? What if I feel lost, confused, or discouraged? I can find a second or third solution and describe how the pathways to these solutions relate. I can ask questions to clarify the problem, and I can keep working when things aren’t going well and try again. I can show at least one attempt to investigate or solve the task. In Struggle for Smarts? How Eastern and Western Cultures Tackle Learning, Dr. Jim Stigler, UCLA, talks about a study giving first grade American and Japanese students an impossible math problem to solve. The American students worked on average for less than 30 seconds; the Japanese students had to be stopped from working on the problem after an hour when the session was over. How might we bridge the difference in our cultures to build persistence to solve problems in our students? 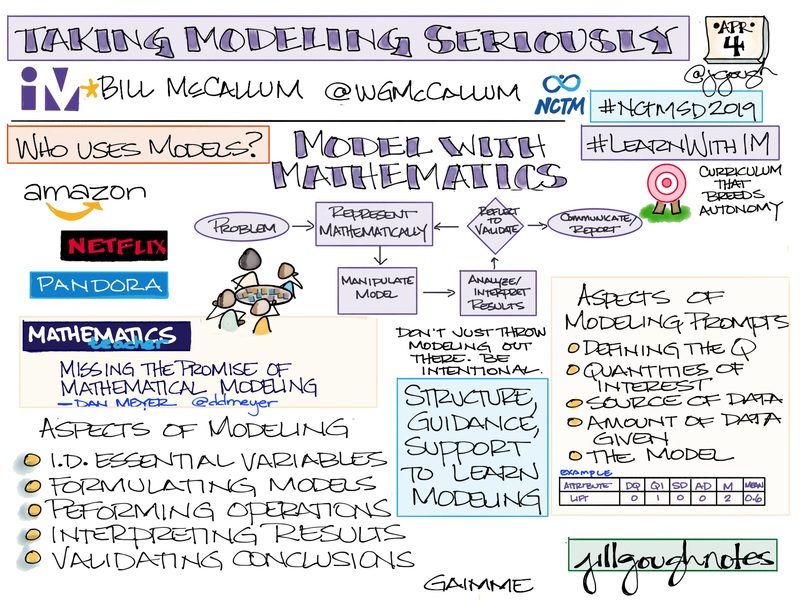 NCTM’s recent publication, Principles to Action, in the Mathematics Teaching Practices, calls us to support productive struggle in learning mathematics. 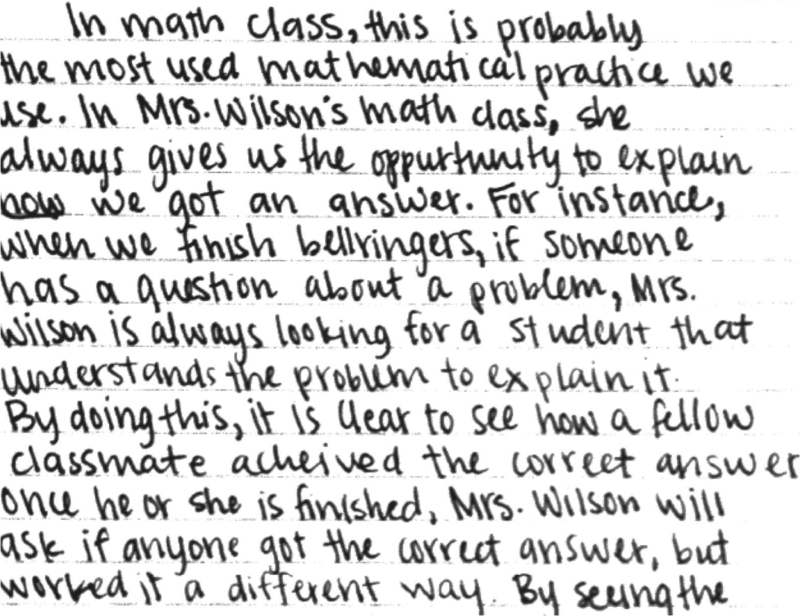 How do we encourage our students to keep struggling when they encounter a challenging task? They are accustomed to giving up when they can’t solve a problem immediately and quickly. 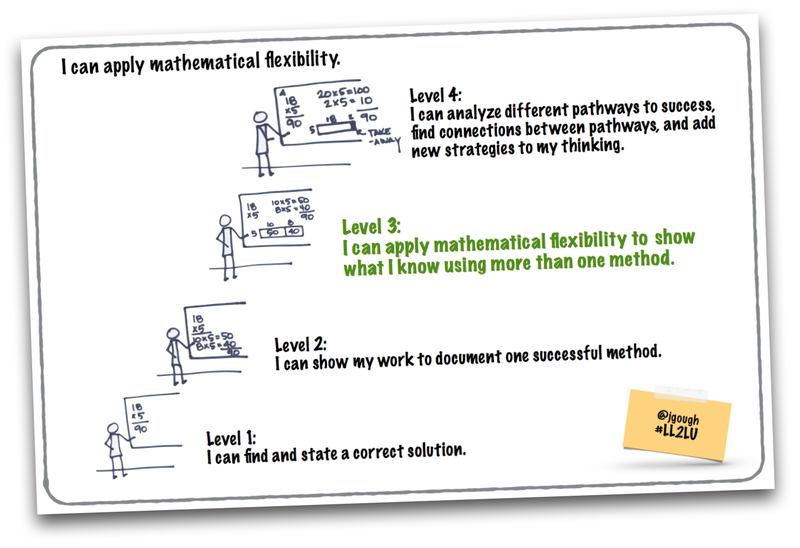 How do we change the practice of how our students learn mathematics?